Still using Pic Scanner classic app? Upgrade to Pic Scanner Gold here. If you have a newer device (iPhone 6, 6S, 7, 7S, 8 or X; or iPad Air, Air 3, Pro, Pro 2, Mini 3 or iPad 4), you may save up to 60 photos at a time to Photos app and 40 over the internet e.g. to Dropbox, Google Drive etc. With an older iPhone (5, 5c, 5s or SE) or iPad (3, 4, Mini, Mini 2, Mini 3), export maximum 30 photos at a time to Photos app, and to 15-20 photos over the internet. Larger batches may result in incomplete or failed uploads. Use this method when the batch size is within the above limits. For instructions on exporting larger batches, scroll down to Export with iTunes. On Gallery or Album screen, tap Select > Tap thumbnails of photos. They will get check marked. Sharing options are displayed. Choose from the popular options shown, or tap Show all to see more options. Photos: This saves to Photos app on your iPhone or iPad, PicScanner folder. No internet is needed. If you have wi-fi and have enabled iCloud, photos also sync to Photos app on your computer and other iOS devices. The options below require an internet connection. If using mobile data, data charges may apply. Message: Attach photos, then add a text message and send. Email: Ensure email is set up on your iPhone or iPad. This option is OK for a few photos, but don’t attach too many: Most email programs limit the size of attachments or reduce file size. Don’t transfer to computer by emailing photos to yourself. Do it via iCloud, iTunes or other cloud services. Facebook limits us to posting a maximum of 10 photos at a time. If you select more, it will only post the first ten. Facebook obviously knows a thing or two about the attention spans of its users! Dropbox: When uploading, stay on Export screen for at least a minute after uploading starts. This will allow Dropbox to queue all photos. After this, you may stay on Export screen or switch to another screen or app. Do not completely exit Pic Scanner Gold until upload is complete. Photos are saved in Dropbox / Apps / Pic Scanner Gold folder. WhatsApp, Instagram, Twitter: Similar to Messages, but these services only allow one photo to be attached. If you select multiple photos, these options will be greyed out. Show All: Tap this to export photos to all other storage, cloud, social network and message apps installed on your device. Select any, and follow the on-screen instructions. Use this method when you need to export a very large number of photos in one go. Launch iTunes on your Mac or PC. Connect your device to it with USB You will soon see your iPhone appear as an icon in iTunes (See point C in this post: Red circle marked ‘1’) Click this icon. Scroll down this list of apps – all the way down to File Sharing section (5). Locate and click Pic Scanner Gold (6). The right side will show some folders and files e.g. original_images, splitted_images, etc. Drag splitted_images folder on to your desktop. All your scanned / cropped photos will be in it. Once you select photos and tap Export (See below), you can choose to include or exclude captions. If you choose ‘Include’, the app will add a white border around each photo and imprint the captions you have input below the photos. This feature requires a one-time in-app purchase. Another option is to go to Goodies and create a shareable album – an auto-play slideshow of between 6 and 24 photos, which will include captions. 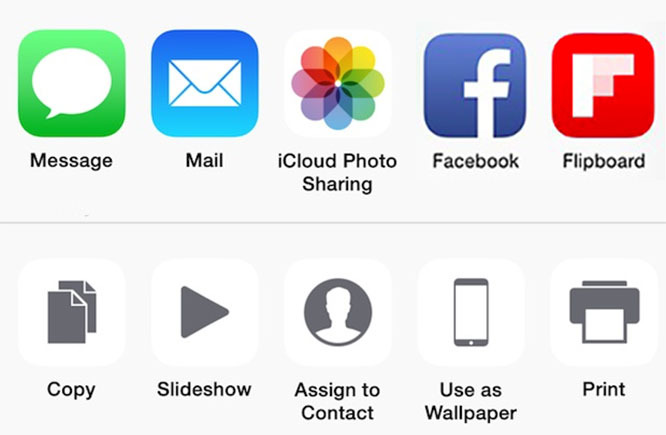 You can share it via all options available in Export, and it’s a great way to share memories.